translated by Daphne Lawless, translation originally published here. “I didn’t go down into the crowd.” One @sinaute expresses, in the comments section of Daniel Schneidermann’s latest article, his unease with respect to the discourse of “national unity” after the murderous attacks against Charlie Hebdo. Under discussion, the “Islamophobic drift” of the magazine and of the “Michel Onfray/Charlie Hebdo/Caroline Fourest secularist” left. Great unease. I didn’t go down into the crowd. I am not Charlie. And believe me, I am as sad as you are. But this emotional unanimity, almost compulsory for those who listen to public-service radio and read the mainstream media, I get the feeling that they’ve already tried to shove me into it, twice. French society is completely alienated, but it keeps telling itself its stories. First story: France winning the FIFA World Cup in 1998. Unanimity: Lilian Thuram for President, Black-White-Arab [United], etc. Then, I was in the crowd. A few years later: Player walkouts at the 2010 FIFA World Cup, [commentator Alain] Finkelkraut and his “Black-Black-Black” [comments on the racial composition of the French team – trans. ], an outburst of hate against those millionaire ghetto punks, a systematic distrust of illiterate sportspeople emerging from the post-colonial lumpen-proletariat. Wonderful, this “national unity”. Second story: between the first and second rounds of the Presidential election in 2002 [where conservative Jacques Chirac faced off against fascist Jean-Marie Le Pen – trans.] 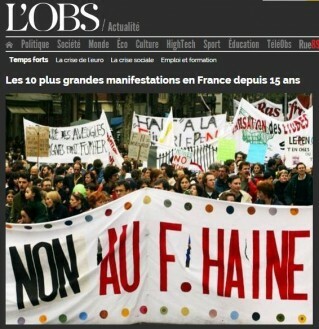 Unanimity: the National Front would not pass, “clothespegs [on the nose to vote for Chirac]”, “survival of the Republic”, a “multicoloured” crowd and Moroccan flags on the night of the second round in front of “super-liar” Chirac, the unexpected “saviour” of the Republic, and [his wife] Bernadette sulking, great national relief. I was in the crowd on the demonstrations between the two rounds. A few years later: the National Front surging to new heights, the invention of “anti-white racism”, the creation of a secular-Leftist coalition including Charlie Hebdo and a hard-Right defending “national identity” against radical Islam in France, people talking about “washing the scum off the streets with a power-hose”, hijab derangement syndrome, prayers in the street, mosques, riots in the suburbs, shots fired at police, curfew, hijacking of secularism by the extreme Right, [anti-immigration journalist] Zemmour, [anti-Semitic commentators] Dieudonné and Soral… Wonderful, this “national unity”. Third story: national survival after the inexcusable massacre at Charlie Hebdo in January 2015. Unanimity: national mourning, “we are all Charlie”, massive demonstrations to defend freedom of expression all over the country. Charlie? No-one read it any more. For people on the left who thought about it a bit, their Islamophobic drift under cover of “secularism” and “the right to mock everything” was too obvious. For people on the right: they detested this kind of post-1968 culture, but it was always nice to take the piss out of those Middle Eastern mediaevals. For the extreme right: not read, its writers and cartoonists detested culturally and politically, but very useful, its cartoons reprinted in “Secular Response” [an extreme-right Islamophobic website – author’s note]. For a lot of Muslims: a weekly insult, but you keep your mouth shut, that’s “French culture”. Result: hundreds of thousands of Muslims summoned to prove their bona fides, scarcely a few years after the official purge around national identity. Year after year with the same insistent message: damn you, when are you going to integrate? And you, “moderate” Muslims, why don’t we hear from you more? Starting from today, “you are either for us or against us”. Cabu [one of the murdered cartoonists – trans.] 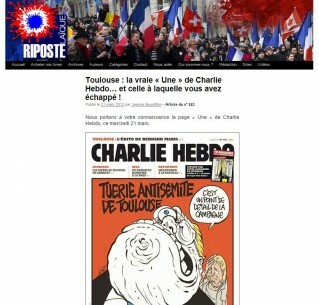 didn’t say any different: “They have to accept caricature, it’s part of French culture”. Wonderful, this “national unity”. Angry reactions from kids in the neighbourhoods heard on the radio: “it’s not possible, it’s too gross, it must be a false flag”. [Anti-Semitic commentators] Dieudonné, Soral and the conspiracy theorists went that way: obviously some don’t believe in January 7th any more than they believe in September 11th. The reality is that we already lost these people a long time ago, and we’re not going to get them back with public candlelit vigils, nor with calls to “resistance” – what are you “resisting”, really? Are you going to subscribe to Charlie Hebdo? What will that change? Collective reassurance is a healthy and understandable impulse, faced with such a traumatic massacre. But its flip-side is collective denial, resulting in forgetfulness of the real and profound causes of alienation. The majority will feel better, it will do them good, like it did them good in 1998 and 2002, and that’s precious. But the split in society is complete. And ideological confusion is at its height. No-one asks how we got here, how young Paris kids ended up massacring journalists and artists with a Kalashnikov after a stint in Syria, with no idea about the life or the ideas of the people they killed: they were just on the hit-list of Al Qaeda in the Arabian Peninsula. No-one can see that French society, behind a façade of unity faced with a horrific event, is really more than ever completely alienated, that it’s desperately pitting the most deprived against each other, and that in just over a decade it has produced its own internal enemies. No-one wants to see that the biggest producer of Al Qaeda soldiers on our territory is PRISON. No-one understands that France didn’t break down in 2015, but ten years earlier, during the riots. No-one wants to see that we are still suffering the long-term consequences of the immense colonial and post-colonial humiliation, and that because of this, your lectures about “civilisation” and “freedom of expression” fall on deaf ears for some of those who suffered this humiliation, and STILL suffer it. And they continue to tell themselves their stories, after the World Cup fiction of 1998, after the “Republican Front” myth of 2002, this time repeating “freedom of expression” over and over like a hiccup, the last resort of a society which can no longer find any reason for existence than the fundamental right to take the piss out of “others”, like a deus ex machina which will miraculously repair this “national unity” which has been ripped to shreds.